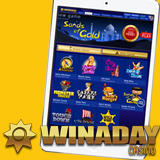 When WinADay Casino started making all of its instant play casino games using Flash technology a couple of years ago it was the latest and greatest way to make online casino games. The only problem is, Flash games don't play on iPhones and iPads which have become increasingly popular in that time. Enter HTML5 -- a new technology for making games that is compatible with all mobile devices including iPhones and iPads, as well as Android devices running on the latest system update. The new games look and sound great and they load quicker than most I've played. In this stage, all 11 penny slots have launched in the new format. Three brand new penny slots will be added during the birthday month. WinADay’s Birthday Slots Tournaments continue until the end of the month and players also have until the end of June to qualify for Game of the Month prizes which are double during the birthday month. The month-long Birthday Slots Tournament Series will award $700 in prizes every day for a total of $21,000 in tournament prize money. There is no tournament registration or entry fee. All players playing the designated tournament game of the day are automatically entered. Tournament games include new games like Dollar Storm and Gladiator Games as well as some of the casino’s very first games like Wheeler Dealer and Gold Boom. The Game of the Month for June is the Birthday Bash slot game. Every 500 rounds played earns one ticket in a month-end draw for $1000. Prizes are doubled for VIP players who stand to win $2000.